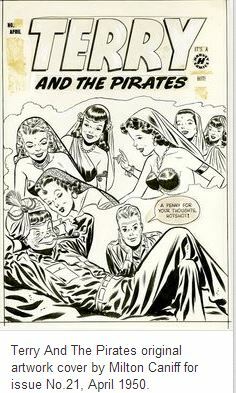 Milton Caniff was called “The Rembrandt of Comics”. 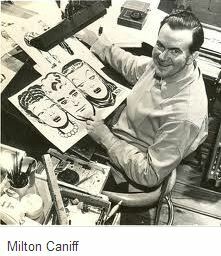 He was born in Ohio in 1907 and became famous for his comic strips Terry and the Pirates and Steve Canyon. Starting in 1932, Milt drew the comic strips Dickie Dare, The Gay Thirties, and Mister Gilfeather for the Associated Press. Then in 1934, he was hired by the New York Daily News and started producing Terry and the Pirates, the strip which made him famous. Terry and the Pirates told the story of the adventures of a teenager, Terry Lee, as he grew to manhood seeking a lost gold mine in China. During World War II, Terry matures and joins the U.S. Army Air Force to become a pilot, and this is where the strips connection with a true war hero begins. Terry’s Air Force flight instructor was Major Flip Corkin who Americans came to know as a dashing but modest hero. Milt Caniff based his Flip Corkin character on the real life Army Air Force pilot Colonel Phil Cochran. Colonel Cochran was born in Pennsylvania and had an interest in aviation at an early age. He attended Ohio State University where he met Milt Caniff and joined the ROTC. When war broke out he joined the Army Air Force and trained as a fighter pilot. 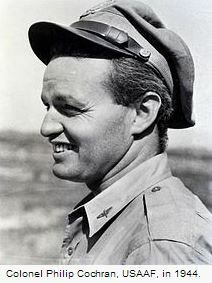 Because of his leadership and organizational abilities, Cochran became the leader of a P-40 squadron that became legendary in the fighting in North Africa. Colonel Cochran went on to become the commander of the 1st Air Commando Group in India and Burma. As described in one of my previous blogs, Jackie Coogan was a glider pilot with this group. Under Colonel Cochran’s command, 1st Air Commando aircraft towed the gliders of Operation Broadway during the invasion of Burma by General Wingate’s Chindit forces. Colonel Cochran’s men also perfected the tactic of extracting gliders from small jungle clearings by snatching them from the ground using nylon ropes attached to the gliders and stretched between two poles. News of the evacuation of wounded men using this technique greatly increased the morale of the soldiers fighting in the jungles of Burma. After an illustrious military career, Colonel Cochran retired from the Air Force and returned home to Erie, Pennsylvania where he joined his brother’s company, Lyons Transportation Lines where he eventually became Chairman of the Board. Another interesting note about the Colonel was that he dated Betty White during the early 1960s and proposed to her. Betty declined his marriage proposal and eventually married Allen Ludden. Phil Cochran died August 26, 1979, but he will not be forgotten by those of us who remember the comic strip Terry and the Pirates. More information about the men and women who fought in Burma and India during World War II can be found in my book Kicker which can be found at the links below.